﻿ Using Stones for Personal Growth. Tiger Eye: Depending on Someone. 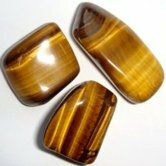 Tiger Eye is an opaque stone that has a silky luster of gold and brown tones. It is made up of quartz that encloses many slender fibers of crocidolite, a sodium iron silicate. These thin fibers give it the property of chatoyancy, which means that it glimmers when a ray of light shines on the surface, like the eyes of a cat. When you look at a piece of polished tiger eye, you see shimmering streaks that go from golden yellow to brown, changing color according to the angle of the light. Deposits are found in South Africa, USA, Western Australia, Burma, and India. In ancient times, Roman soldiers wore tiger eye engraved with symbols for protection during battle. Tiger Eye acts on the Inner Being to strengthen the ability to Need and Depend on another person, and to count on him to be there when you need him. Needing or depending on someone is being able to draw on his energy and use it when necessary. It is depending on him to give you what is good for you, since what is good for you is always what you truly need. It greatly enhances your life to have someone to depend on. Whenever you depend on anyone, you also become dependent on him. It takes confidence in someone to place yourself in the vulnerable position of counting on him and being dependent on him, because there is always the possibility of being let down. Being able to need someone and depend on him or her, is part of being able to love. You can't love someone if you don't feel comfortable about needing and depending on that person. Having someone in your life you can depend on, enhances your life and makes you feel very comfortable with him or her. Once you recognize that someone is good for you to be around, you start to need that person and the energy interaction you have with him or her. This feels so comfortable that it can almost make you purr. You want to slide up to your partner, turn yourself over completely, fall into him or her and bury yourself there. Needing someone has both a doing side and a knowing side. The doing side is allowing yourself to actually need someone and depend on him. The knowing side is knowing how dependable someone is. It is knowing who you can count on and depend on, who it is wise to let yourself need. These two aspects of need form two sides of the same duality. This means that when you know who you can depend on, you also increase the ability to need people in general. If you have trouble letting yourself need people, you sometimes refuse kind offers of help because you are afraid to rely on others. Because of your inexperience in needing people, you don't know who to rely on, and at times you rely on people that let you down. You tend to fall for the wrong person, because you are not good at knowing who to let yourself need, or who to stay away from because he will let you down. This can make you feel lonely and isolated. To strengthen your ability to need people, work at becoming involved only in stable relationships where you can truly feel safe. Stay far away from controlling and crippling "codependent" relationships, in which both people feed on each other's shortcomings. Feeling safe in a relationship comes from knowing you are compatible to the extent that the other person would not knowingly do anything to harm the relationship in any way. When you know you are safe with someone, it is much easier to allow yourself to need him and depend on him. To strengthen your ability to depend on someone, be willing to work at making a relationship strong. Pursue a deep and meaningful relationship with someone, and encourage it by extending yourself to that person on an ongoing basis, continuing to court him long after you have convinced him to have a relationship with you. Never stop working at the relationship. This not only keeps the romance going, but it also builds a lasting friendship in which you come to need and depend on each other. It is much easier to feel comfortable about depending on someone when you both value your relationship enough to want to put energy into maintaining it. You also expand your ability to depend on people by becoming more aware of what you really need help with. Don't ask for help with things you could just as easily do for yourself. Learn to use people's energy with care so that you don't harm them or misuse them. Develop your awareness of the difference between what is reasonable to ask of people, and what is burdensome to ask. This will help you know how much you can lean on someone without taking advantage of him, and without wasting his energy unnecessarily. And it allows you to be dependent on him without being a burden. If you make unreasonable demands of your friends, they feel used, and that isolates you from them and makes them less willing to let you need them.